Are you talking to your clients about Long Term Care (LTC) and Linked Benefits? If so, great job! More than likely you have seen the positive impacts these conversations have on your business, as well as the lives of your clients. We know this to be true, which is why we are sharing client facing tools like this downloadable LTC infographic to help start the conversation with your clients. Linked Benefit Products - life insurance with extended LTC benefits. Guaranteed benefits and premiums. Accelerated Benefit Riders - life insurance where the death benefit can be used to cover LTC costs while alive. Guaranteed benefits and premiums. 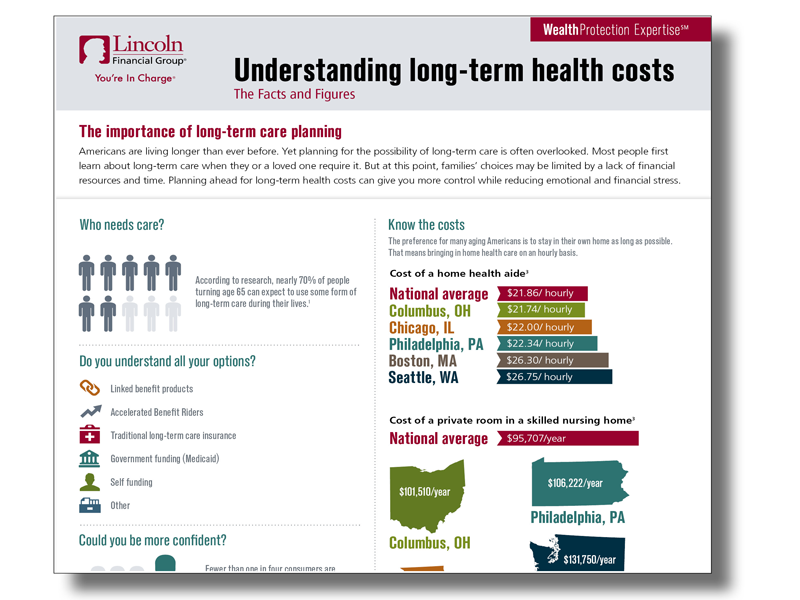 Traditional Long Term Care Insurance - use it or lose it LTC coverage. Government Funding (Medicaid) - which doesn't cover most LTC costs. Self Funding - can be 3 to 4 times more expensive than a predefined plan. The best options are often Long Term Care and Linked Benefit products. Download the infographic below to help your clients understand how important LTC protection is for their financial future. Speaking with your clients about their retirement and financial future will help to build relationships and secure your clients assets in their retirement. Try for yourself and speak with one client a week on LTC benefits and drive your sales goals in 2017!